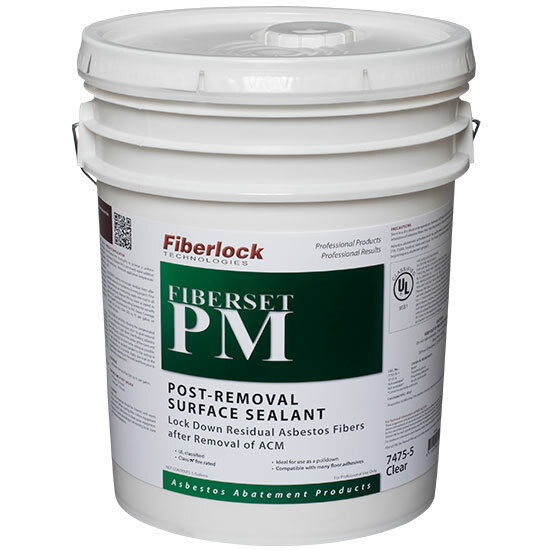 Fiberset PM is a pre-mixed, lockdown sealing treatment for microscopic residual fibers present after the removal of Asbestos Containing Material (ACM). Fiberset PM is a water-based coating that employs advanced, 100% acrylic resin technology to extend the life expectancy of airless spray equipment. Carefully clean up with a wet mop or HEPA vacuum. Stir Fiberset PM thoroughly to achieve a uniform consistency. Fiberset PM is premixed; water-addition is not necessary. Minimum application temperature: 45°F. LOCKDOWN: Sealing microscopic residual fibers after asbestos removal is mandatory on every project. Prior to post-removal air monitoring, apply one coat to all exposed surfaces. Fiberset PM has been accepted as part of a UL Classified Fireproofing System for use with Retro-Guard® manufactured by W.R. Grace & Co., Conn. Coverage should not be less than 500 sq. ft. per gallon on smooth surfaces. Misting the contaminated air is an effective technique prior to post-removal air monitoring. To pull down free-floating asbestos fibers effectively, stand in the center of the room and hold the spray gun as close to the ceiling as possible. A mist should be sprayed parallel to the ceiling in every direction or in a circle. Apply one coat to the polyethylene sheeting on the walls and floor prior to dismantling containment. Lockdown: Not less than 500 sq. ft. per gallon. Tools and drippings should be cleaned with warm soapy water before coating dries. Follow equipment manufacturer’s directions to clean spray equipment. Dispose of all waste according to current local, state and federal regulations. Store in a dry place at temperatures between 40°F (4.5°C) and 90°F (32°C). Approved respirators must be used to prevent inhalation of asbestos fibers that may be present in the air. Protective clothing should be worn. Careful consideration must be given to all EPA, OSHA, federal, state and local regulations in effect prior to the application of this product.